For those wishing to clock up some serious holiday kilometers, the Rapha Festive 500 throws down the ultimate cycling gauntlet; to ride a minimum of 500km between Christmas Eve and New Year’s Eve. Achieving such distance in so little time is no mean feat, and illustrious tales of deserted centuries, catastrophic mechanicals, and challenge-ending physical failure or injury abound with those who have tried before and been unsuccessful. More likely though, is that in past attempts the reason for failure may have been nothing to do with riding at all. Rather the lure of staying in with a few leftover roast potatoes was just too tempting; the invites for pints with old friends, even if it was ‘just the one’, were all too appealing; or the weather will have had its own ideas to scupper the attempts of those festive journeymen. Although the Festive 500 is no light undertaking, with a little planning, some good friends and a little more luck, it can be a truly rewarding week, exercising the resilience of rider and machine. If the festive season is to be spent somewhere less familiar visiting some long-lost branches of the family tree, why not take your bike and seize the opportunity to explore? Let’s roll through some suggestions to make sure your Rapha Festive 500 a ride to remember. Start your Rapha Festive 500 journey by joining the challenge on Strava and have your ELEMNT Bike Computer set to auto upload each days’ rides directly to Strava. Ahead of le Grand Depart on Christmas Eve, you should have a good idea about where, when and how you’re going to amass your 500 kilometers over the following 8 days. This should be nailed down at least ten days prior. Below are some key variables to consider before heading out the door. Take a holistic look at your week of riding and think carefully about the weather. Making the appropriate kit choices if you’re expecting snow and ice or sun and humidity goes without saying, but be prepared to alter your routes based on the weather if necessary. Imagine you’re going to ride to meet some friends for a mulled wine, that ride home might start looking even more treacherous if there’s snow or ice to deal with, so plan accordingly and don’t take undue risks. If you’re in the northern hemisphere, it’ll likely be cold, dark and/or wet for most of the time, so bright lights and mudguards are a no-brainer. If you live further south, consider a lightweight kit for riding during the heat of the day. It’s probably also worth giving your bike a good clean and service before you start. A slew of silly mechanicals as a result of a poorly maintained bike would be a disappointing end to your challenge! Remember, over-preparation is a good problem to have; take a look at these kit ideas from Rapha to inspire your Festive 500 wardrobe. Consider your social engagements, family commitments, overindulgent meals, scheduled naps on the sofa after a couple of eggnogs, we could go on… Point being, it may be possible to ride to or from these events, so even if grandma’s house doesn’t have a work stand, a BB tool or a parts cleaner, she might not mind you bringing your bike along to a Christmas lunch (if you promise to wash your hands first)! After considering your Holiday schedule, weather and other variables it’s time to start planning what your rides will look like, where you will be heading and how you will get there. It’s a good idea to have your routes nailed down before you start the challenge, so you just have to worry about getting outside and conquering the distance. A bicycle is a magnificent tool for adventure, and the ELEMNT family of GPS bike computers are unrivaled when it comes to navigating, so check out RidewithGPS.com or Komoot.com to get those creative routes to Grandma’s lunch nailed down. Check out our post on how to upload routes to your ELEMNT or ELEMNT BOLT GPS Bike Computer. Time To Ride With Friends. Joining forces with others to complete your Festive 500 rides is a sure-fire way of making sure you get the distance done. Even if you prefer riding solo, arranging the odd rendezvous with some riding buddies could be the boost you need to get out of bed and on the road, especially if the weather looks to be turning against you. It’s Never Too Late to start Preparing. If you’re treating this year’s Festive 500 as a way of kick-starting your 2019 riding ambitions, then consider adding some indoor workouts to your training plan. Let’s be honest, unless you’ve spent the autumn splashing around muddy cyclocross courses or grinding up lung-busting hill climb races, the chances are you have been enjoying some well-earned rest and recuperation. This time of year is great to start building from where you left off in the autumn by boosting your aerobic fitness. Try some of our trainer workouts to get started. If #crossisboss and you’re headed into the Festive 500 with a good level of fitness, you can set yourself an additional challenge of getting some quality indoor miles in before the Rapha #Festive500 kicks off on Christmas Eve. Your outdoor rides are unlikely to be totally flat, so to help you prepare Wahoo is joining forces with indoor cycling titans ZWIFT to host an in-game climbing mission from December 1st to 23rd. It’s easy; the more you climb in ZWIFT, the more amazing prizes you’ll be in with a chance of winning, including a complete Wahooligan Indoor Training Ecosystem worth $1899.99! So there we have it! 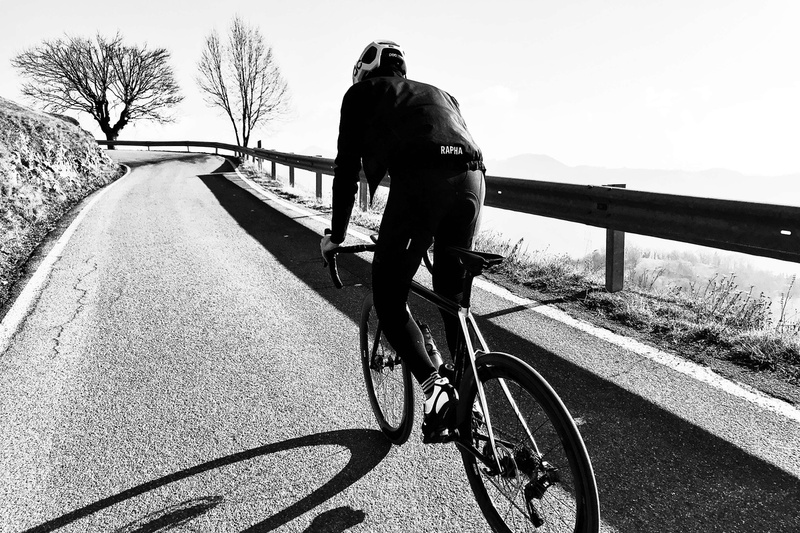 Hopefully, by following these steps you’ll rise to the challenge and ride your way into Rapha #Festive500 glory. However you set out to conquer the challenge, remember that this is a time of year for friends, family, and for enjoying some two-wheeled adventures along the way. The Rapha #Festive500 encompasses much of what it is to be a Wahooligan, so make sure you tag #wahooligan, #InMyElemnt, #Festive500 while you’re out there. See you on the road! Join the Wahooligans from all over the world this Festive Season between December 24th – December 31st for the Rapha Festive 500.